The beach is somewhere we have only been to a handful of times over the last few years and many of those times it was winter and we were all bundled up in coats, hats and wellies. This meant no worries about sand getting under toe nails, no panic about her standing on pebbles or shells and no scrapes or cuts that could lead to infection. However, I think this fear has been well and truly broken. When the lovely parents of a very dear friend of ours heard about Max breaking his leg and us cancelling our holiday to France, they offered us the use of their caravan which is located on the beautiful North Coast of Northern Ireland. So we took them up on this very kind offer and headed up last week. The caravan is a one minute drive from the most beautiful beach and the day we arrived the sun was shining, so we decided to nip down for half an hour to enjoy some sea air. When we arrived and stepped onto the sand I couldn’t get over how soft and clean it was and as the kids jumped excitedly out of the car I must have had some kind of out of body experience as I said to Daryn…’take Lucia’s tights off’. I honestly don’t know what came over me! Max had his shoes off in seconds and was away crawling around the sand, trying to dig a hole with his hands and just enjoying the warm feeling of it on his feet. After weeks couped up in a heavy cast he had the biggest smile on his face as he buried his feet in the sand. The beach was also a fantastic way to help Max strengthen his leg without even realising it as the sand worked his little muscles! Then Lucia’s bare feet hit the sand – for the first time EVER. I cannot describe the pure, unadulterated joy that she expressed at this simple pleasure – one that we all take for granted and never fully appreciate. Watching my three year old daughter experience it for the first time brought tears to my eyes and I couldn’t take my eyes off her. I know in my last post I talked about how ‘free’ she seems when her compression garments are off – but this was freedom on a totally new level. She was completely liberated. Her little face lit up with glee and her eyes shone with absolute delight. The excitement she felt was simply unparalleled. She ran up and down, crawled on her hands and knees, rolled about, scrunched up her toes, made sand angels and even face planted in it! And the whole time she was doing this she was squealing with happiness. And as for the sea…she ran in shrieking at the cold but loving every second. She ran in and out over and over, splashing through the little waves, kicking up the water and had her first ‘swim’ when she fell over! What we thought was a quick visit turned into 2 hours of fun. Two hours of the four of us jumping over waves, splashing each other, building sandcastles and enjoying some wonderful family time. I did keep an eagle eye out for anything on the sand that may have caused injury such as shells or pebbles and lifted anything I thought may have been a risk but there was very little. The beach is a National Trust beach and looked after impeccably. I also felt really reassured knowing that the caravan was just that one minute drive away, so if I was worried about anything at anytime we could be back there immediately. It was also fantastic to be able to have Lucia in the shower and washed down within 10 minutes of leaving the beach. We inspected her toes, feet and legs thoroughly and moisturised her deeply to ensure her skin didn’t dry out from the salty water and put her garments back on. We had the most fabulous weather and did this four days in a row and had the most perfect little holiday. The caravan was wonderful, a real adventure for the kids and in the absolute perfect place for us to be able to enjoy beach time with both Max and Lucia. Watching them chasing each other about the sand, playing together, digging holes, splashing in the sea and overall just enjoying themselves – both in bare legs and feet – was priceless. This was a fantastic ‘first’ and definitely won’t be the last. 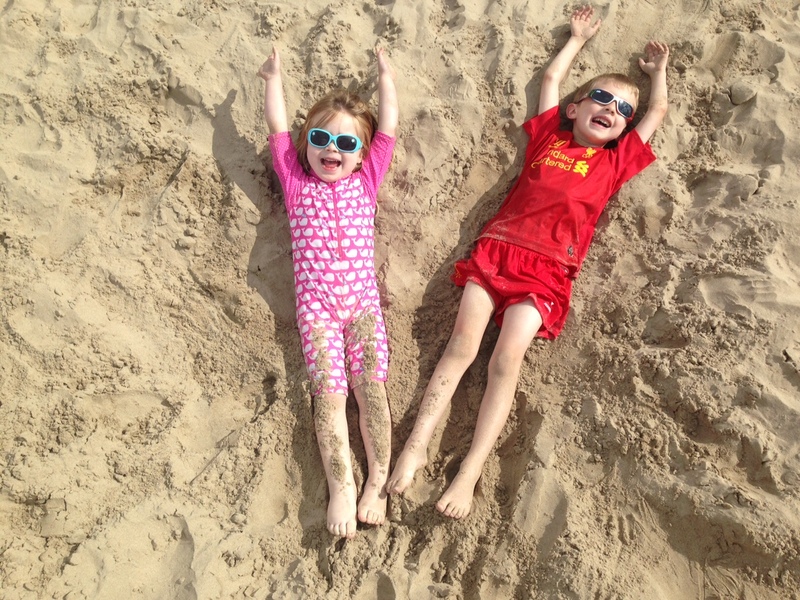 ‘A little sand between your toes always takes away your woes’ – this summer it certainly did just that! You take such good care of her 🙂 I’ ve written here once before. I also have pr.lymph. and I have lived with it for the last 20 years, I’ m 33. But I am still not very careful except when it comes to sunburns and burns. I have gone through two pregnancies without any changes in my leg… And that was just miraculous. Because you take such good care of her leg she will have a great start and fewer problems than I had. My leg is pretty big because of two years without any help and then 5 years withe no custom fitting. Fantastic! So wonderful for her, such a simple thing that most people take for granted. So lovely she got to enjoy it. You are just amazing with her! ? Fab article, as a Lymphie sufferer I understand the feeling of freedom without stockings! Some experiences are worth a little risk ?